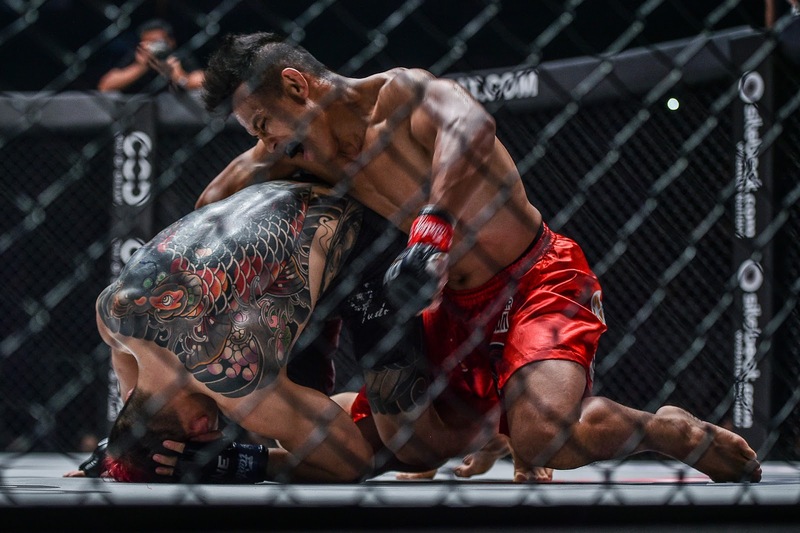 PASAY--Edward Kelly prevailed in an up-and-down battle against Lee Sung-Jong to give the Philippines another win in One: Roots of Honor at the Mall of Asia Arena on Friday night. Both Kelly and Lee engaged in what seemed like a Fight of the Night-worthy battle with both fighters exchanging shining moments in the first round. Lee got first by putting the match to the ground right after the opening bell. But Kelly responded with his own ground-and-pound and submission attempt. However, the momentum was stopped with barely a minute left in Round 1 when the referee issued him a yellow for an illegal kick to Lee's head while getting out of a leglock. The high-octane action continued right after the momentary stoppage and even at the start of Round 2, when Lee tried to submit Kelly again. However, Kelly overturned the situation and eventually found an opening for a ground-and-pound that forced the referee to call it a technical knockout. Kelly's win made up for his older brother's loss earlier Friday to Kwon Won-Il as the siblings split their assignments against the South Koreans. Meanwhile, Brazilian Anderson Silva, not to be confused with the Ultimate Fighting Championship legend, knocked out Australian opponent Andre Meunier in a heavyweight kickboxing bout.